As a weekly columnist for the Sacramento Bee, Peter Schrag hones in on the social issues that define life in California. His numerous books have insightfully challenged conventional wisdom on education, immigration, the economy, and the state’s political system. 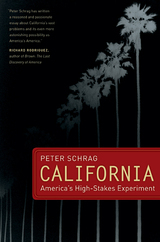 Executive Editor Naomi Schneider interviewed Schrag, author of UC Press’s recent book California: America’s High-Stakes Experiment. What motivated you to write California? Why now? As someone who’s been following and writing about California issues for some thirty years, I’d done a fair amount of thinking about the great changes in the state’s demography, economy, and social conditions and about the state’s continuing uncertainty about the directions in which it wanted to go. And since California’s demographics foreshadow the nation’s a couple of generations hence, how we handle our pressing issues could have great significance—and maybe point a way—for the country as a whole and maybe for much of the world. Since I’ve long had great respect for the books you’ve edited and for UC Press as a whole, it seemed not only a natural, but an exciting, prospect. One issue the book focuses on is immigration, about which there is a lot of debate in the media. We are now witnessing the beginning of a social movement for civil rights by immigrants themselves. How do you assess today’s immigrant California? It’s one of the most fascinating stories not only for the moment but in our history. It’s clear that California, like a growing part of the nation, is dependent on immigrant labor and skills and will become more so in the coming years as baby boomers retire. It’s a complicated picture because, as I say in the book, we’re all immigrants to the new world and society developing around us. So it’s not just a question of how well immigrants assimilate, but how we respond to them. Will we be willing to support good public services, especially in education, for a population that is ethnically different from the voters, two-thirds of whom are still non-Hispanic white? Since a significant part of that population is also composed of illegal immigrants, the challenge is even greater. Obviously those questions also reflect the great debate now going on at the national level. California’s experience has a huge bearing on that debate. What is the biggest challenge that California faces today? The challenge is to reinvigorate our democracy to make it more responsive and comprehensible both to voters and to the people at large. It’s to mitigate if not reverse the current drift to ethnic and economic divisiveness. That involves a vast range of issues from the reform of our dysfunctional governmental processes to better public understanding of the demands of a global economy—indeed a global world—that transcends the familiar old institutions. California is the epicenter of that new world. If we can do it, we’ll be a beacon to the world. How would you judge Arnold Schwarzenegger as governor? Do you think he’ll win reelection? Arnold defies conventional assessments. I’d give him a C-minus as governor. He helped California get by the immediate fiscal crisis it faced when he was elected, but he has addressed none of the state’s fundamental problems and is now governing by the same short-sighted fudge-and-borrow tactics that brought us into this mess. He tacks and weaves so much, no judgment should be carved in stone. I think he will be reelected, not because he’s done so well, but because he will not have an opponent who, in the conventional dynamics of media politics, will be charismatic enough to overshadow him. I think Phil Angelides is by far the most thoughtful of the three major candidates, but Angelides, an old-fashioned New Deal Democrat, is probably too liberal and not sufficiently telegenic to win. He is the smart kid in the class, and, as Gore discovered in 2000, voters prefer the class clown. Is your vision of California today bullish or bearish? What lies ahead? In the long run I tend to be bullish—the state has so much going for it, in climate, human resources, and its traditions of innovation and opportunity. But that could be decades off. The main question is what the people of California want and how much they’re willing to pay, even sacrifice, for it. And at the moment the idea of even modest sacrifice is not much talked about. I hope it will help the state’s leaders and its voters—and by inference, the nation’s—confront the urgent questions, begin to understand the new world in which we live, and think creatively about the challenges it presents. In a sense, the book itself is a question: Which way do we want to go? Peter Schrag takes on the big issues—immigration, globalization, and the impact of California’s politics on its quality of life—in this dynamic account of the Golden State’s struggle to recapture the American dream. In the past half-century, California has been both model and anti-model for the nation and often the world, first in its high level of government and public services—schools, universities, highways—more lately for its dysfunctional government, deteriorating services, and sometimes regressive public policies. Schrag’s incisive analysis of the state’s political, demographic, and fiscal realities vividly demonstrates that it has been struggling with a range of problems for a generation. The author deftly shows that California’s ability to forge its culturally and ethnically diverse population into a successful democracy will be of crucial importance not only to America, but to the world. He also explains how many current "solutions" exacerbate the very problems they're supposed to solve and analyzes a variety of possible state and federal policy alternatives to restore accountable government and a vital democracy to the nation's largest state and world's fifth largest economy. Peter Schrag is a contributing editor and columnist at the Sacramento Bee. He is the author of many books, including Paradise Lost: California's Experience, America's Future (UC Press) and Final Test: The Battle for Adequacy in America's Schools.